Land managers: N.C. Wildlife Resources Commission, U.S. Army Corps of Engineers. Note: Some or all of this trail is on gamelands and hunting is allowed. Learn about local hunting seasons here. Trailhead/Access: Barton Creek Boat Ramp off Six Forks Road and NC 98. Click on map below for specifics. Engineering solves a tricky bridge problem. After leaving the ample, paved parking lot the trail quickly passes through a short but aromatic stretch of pines, before reentering a maturing hardwood forest. Just over a half mile in is a spur to the right that leads a short distance to a small beach in a cozy cove, a great place to cool off on a summer’s day. The trail continues in and out of coves. Just under a mile and a half in the path rounds a point and gives view to Raleigh’s emerging Forest Ridge Park on the far side of the lake, a destination for another day. There’s a little more up-and-down as the trail navigates two more coves before climbing to an abandoned, paved roadbed from the area’s pre-lake past. Follow the roadbed for a tenth of a mile before diverting left and encountering an old homestead, tipped off mainly by the ancient shade oak that dominates trail left. Another 100 yards or so to NC 98 and the end of Section 7. If you’re continuing on to Section 8, be especially careful crossing the busy, high-speed NC 98. Geology Highlights: This trail section includes soapstone, mica schist, milky quartz, and a sandy pocket beach along the lakeshore. Click on the link below the Google map to open it up in a larger version which includes definition of the map symbols, hiking notes, and an interactive option for driving to the trailheads. Thanks to Mark Edelstein for these detailed hiking directions. 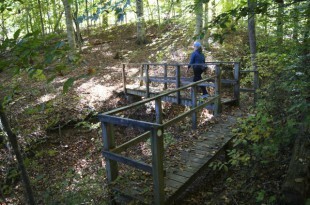 Cross an L-shaped footbridge, as soon the trail bends to the L to descend slightly and rock-hop across a small creek. Cross a narrow roadbed and soon enter a small clearing. Stay L to continue on the trail, soon crossing a pipe conduit. Shortly, the trail turns R across a small creek. Enter a 3rd power line clear-cut by another cove. To traverse this section, turn R, then quickly L for a slight ascent to cross an access road. Soon, turn sharp R, by some posts. Note that a relocation will be progressing thru the end of the year (2013), so watch for trail signage to direct you through this area. Cross a small creek bed on a footbridge and soon turn L onto a wider footpath. Shortly reach the old ‘98’ roadbed (paved) and turn R onto this. Turn L off the roadbed and into woods. Descend to reach NC-98, by end of a guardrail. To continue to the next section, turn R to walk along the grassy shoulder and cross (Use caution!) the road by a double-blazed utility pole.